Paving the way in portable restroom extravagance, the Presidential restroom trailer transforms an often overlooked element of an outdoor event into something truly luxurious. Custom-tailored for those who desire elegance, these extravagant bathroom trailers are a perfect addition to any outdoor wedding or black tie event. Experience the lavish distinctions of this 24’ restroom trailer, featuring an extravagant oak interior and flushable porcelain toilets. 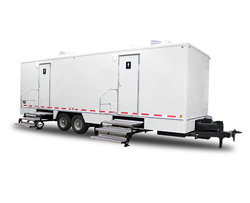 This richly-appointed restroom trailer is ideal for stately happenings such as weddings or any other event where VIP treatment is desired. Injected with the utmost of style and class, this 32′ portable restroom trailer takes style and comfort to unparalleled new heights. Delivering the best in style and functionality, this 34′ ADA accessible restroom trailer combines the best of both looks and accessibility.